Born November 9th, 1892 in Staten Island, New York to Claude and Mary Normand. Growing up in a lower middle class family Mabel eventually had to help earn her keep. At the age of 14 she became an artist’s model, posing for various painters including Charles Dana Gibson. Her image graced many postcards and magazine covers during that time. Mabel’s friends suggested that the beautiful and naturally funny girl try out for the new flickers as it was easy work and good pay. She found work as an extra at Kalem and then Biograph in 1909. There she met Mack Sennett who would be her partner in crime privately and professionally for many years. When the Biograph Company headed for California they left Mabel behind. Not done with flickers just yet she found employment at Vitagraph. There she worked alongside the great early comedian John Bunny. Her time at Vitagraph was moderately successful with her becoming known as “Vitagraph Betty”. Though only a few of these shorts still exist Mabel’s comedic timing and talent is evident. When Biograph returned in the summer of 1910 Mack convinced her to give Biograph another try. The great D.W. Griffith did not like making comedies and decided to use Mabel as a dramatic actress and occasional Indian. Though she did well in these roles Griffith used her sparingly as according to several of his actresses he found Mabel a bit wild. On and off screen Griffith preferred the dainty types, while Mabel liked to play pranks, drink, swear and party with the boys. Linda Arvidson said during this time Dorothy Gish idolized her. Much of Mabel’s later Biograph work was directed by Sennett and co-starred Fred Mace. During this time Sennett was preparing to make his own film company, which would focus on comedy. He and Mabel left Biograph and formed “Keystone Studios” in 1912. Though most think of Keystone as Mack’s baby Mack considered Mabel essential to his studio. When he made his will in the late 1910s he insisted Mabel would receive half of everything, as she had been there from day one. And indeed Sennett would leave Keystone shortly after Mabel left him for Goldwyn. Mabel’s star quickly rose at Keystone. From her first shorts onward she worked with Ford Sterling, Ford Mace and Mack Sennett. As inventive and important as any of these early comedians she had a hand in many firsts, including the first thrown pie gag with 1913’s “A Noise from the Deep”. It was during her short, “The Bangville Police” that the legendary Keystone Kops were formed. She had been writing her films as early as 1912 and in 1914 she won the right to direct her films, being one of the earliest female stars to do so. When Sennett went to see a young Englishman named Charlie Chaplin perform he brought along Roscoe ‘Fatty’ Arbuckle, Minta Durfee and Mabel to give their opinions. After urging from Mabel, Sennett signed Chaplin to his first film contract, but eventually found the young newcomer underwhelming after his first film. Most agree it was Mabel who convinced him to keep Chaplin on and after a two shorts Chaplin was put in Mabel’s care. It was during his first short with her, “Mabel’s Strange Predicament”, that he conceived his legendary Tramp character. Mabel wrote and directed many of Chaplin’s earliest shorts, usually starring in them as well. Chaplin soon became a hit and the two continued working together during the rest of Chaplin’s Keystone tenure. In 1914 Mabel, Charlie, and Marie Dressler starred in the first feature comedy film “Tillie’s Punctured Romance”. The film was extremely popular and Mabel’s star rose further. In the film she plays the street wise girlfriend of Chaplin’s character who is trying to con the innocent Tillie (Dressler). The film ends on a girl power note with Mabel’s character taking pity on Tillie stating they both don’t need him. Many of Mabel’s features would include scenes of her saving the male or saving herself, a rarity at the time. When Chaplin left Keystone in 1915 Mabel found a new partner in “Fatty” Arbuckle. She and Roscoe Arbuckle were also good friends during her life. Reportedly when informed of her death while at a party Roscoe left saying, “My Buddy has died”. The duos shorts were again extremely popular but things began to turn sour with Keystone. While Mary Pickford signed her legendary contract for $1 million a year, both Roscoe and Mabel were making a paltry $500 a week. While Pickford and Chaplin had both obtained complete creative control, Mabel and Roscoe found they were receiving less and less say in their scripts and productions. To add insult to injury, Keystone began hiring a bunch of vaudeville comedians at upwards of $3,500 a week, hoping to bring their prestige to the company name. To make matters even worse Mack and Mabel’s romantic relationship was over as well. As Mabel prepared for their wedding, Mack took to Mae Busch. According to Minta Durfee a confrontation happened and Busch threw a vase at Mabel’s head, causing her a severe head injury. Whatever the case Mabel was severely injured in September 1915 and spent several weeks in the hospital near death. This incident is where many allege she became addicted to either/or cocaine and morphine, both legal at the time. Her great nephew emphatically denies this, stating Mabel’s nurse signed an affidavit swearing so. He also noted that the stories of her ‘addiction’ didn’t come til she had already died. So far no firm evidence has proven Mabel was addicted to anything, other than chocolate and alcohol. In early 1916, Mabel announced she was leaving Keystone which was now a part of Triangle. However by May 1916 she was back with the company…and Mack, under her own production company “Mabel Normand Film Company”. She had her own studio built (which still stands today) and began work on her first independent feature which would be named “Mickey”. Filming was completed by the spring of 1917 but it would not see release until December 1918. It is one of the last films where Mabel’s health is fully intact, and according to many, its one of her best. The film was extremely popular when it finally saw release, though Sennett’s claim that it grossed $18 million is probably inflated. The theme song of the same title also became a sheet music hit, though Sennett again exaggerated claiming it was the first film song hit, the theme from Birth of a Nation had sold very well 4 years earlier and was well known. Though she played many characters during her Keystone years Mabel is perhaps most recognized for her ‘Cinderella’ character which ran throughout many of her features in one form or another. The Cinderella character was usually born poor and through one step or another would be matched with a wealthy suitor. However trouble brews and Cinderella would save the man, the man would save her and in the end they would marry with wealth and safety intact. Such themes run throughout many of her Goldwyn features but are extremely obvious in “Mickey” and “Molly O”. Fed up with Mack once again Mabel left, this time for Goldwyn Studios where she would make $1,000 a week. By the time Mickey saw release, six of her Goldwyn features had already made the rounds with varying degrees of success. Mabel had likely become tubercular during Mickey and her health fluctuated from picture to picture. She also suffered bouts of depression, causing her weight to fluctuate as well. Unfortunately, her health is painfully obvious in her films with Mabel looking tired and sickly in many of them. If she rested she would look well, but then another production or personal trouble would start and she’d work too hard and play too hard causing her health to decline and a sickly appearance on screen and in photographs. Many of her Goldwyn pictures are lost though a few still exist including “What Happened to Rosa?”, “The Floor Below”, “Head over Heels”. Only “What Happened to Rosa?” has been released on DVD. In 1921 Mabel returned to Mack, and together they made “Molly O” which both hoped would be another “Mickey” minus the headaches. Reviews were positive and thankfully the Fatty Arbuckle scandal did not effect the release. The film did well at the box office and work began on “Suzanna”. Unfortunately this time the film would not escape scandal. In 1922 Mabel’s friend, director William Desmond Taylor was murdered. Mabel had been the last one to see him alive after picking up a few books he had for her. Though Mabel was quickly ruled out as a suspect the public was hungry for scandal, and Mabel’s name was heavily associated with the murder. Production was stopped and when Mabel returned she looked terrible, the scandal causing havoc with her health. While the murder to this day is officially ‘unsolved’ the revelations of a self penned memoir by Charlotte Shelby reveal she was the likely culprit. Mabel tried to recoup, and in 1923 Sennett asked her to do one more feature for him, “The Extra Girl” which is considered by many to be her best feature. Cinderella is here again, this time saving her parents and fiancé. Despite decent reviews once again several scandals flared with Mabel’s name loosely attached. This time Mabel seemed to leave film for good taking trips, classes, and performing on stage. However none of it suited her and she returned to film in 1926 signing with Hal Roach to do a series of shorts. Mabel’s shorts were well received, though she was no longer a top star by most means. On a drunken dare she married old friend Lew Cody (who played the villain in “Mickey”) on September 17th, 1926 at 3AM. According to her great nephew, her diaries reveal deep regret for the marriage. Though the put up a good front in public, the marriage was never consummated and they lived at separate homes. Legally they remained married until her death. Sadly in February 1927 Mabel was finally diagnosed with tuberculosis, which she had likely suffered from for almost 10 years. Despite making public appearances her health began to fail slowly and in March 1929 she was taken to a sanitarium, where the press was told she was on death’s doorstep. She died barely a year later on February 23rd, 1930 at the age of 37. During the silent era, women rarely did comedy exclusively. 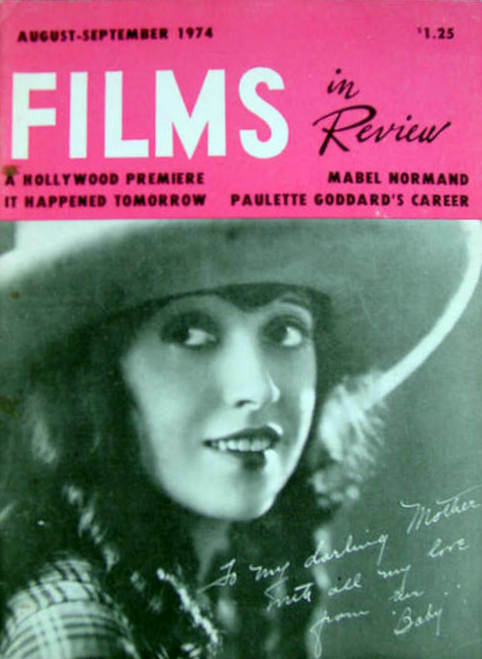 By far Mabel Normand was the most popular comedienne during her time let alone the entire silent period. Her popularity and reign as Queen of Comedy is perhaps most comparable to Lucille Ball who made her mark in the 1950s. Sadly since most of Mabel’s work ended in 1923 she is rarely remembered today, and very rarely discussed when great comedians are mentioned. However she was there from the start, right alongside the greats from John Bunny to Charlie Chaplin. The fact she was a woman in a male dominated genre who made herself a household name is just makes her all the more incredible.